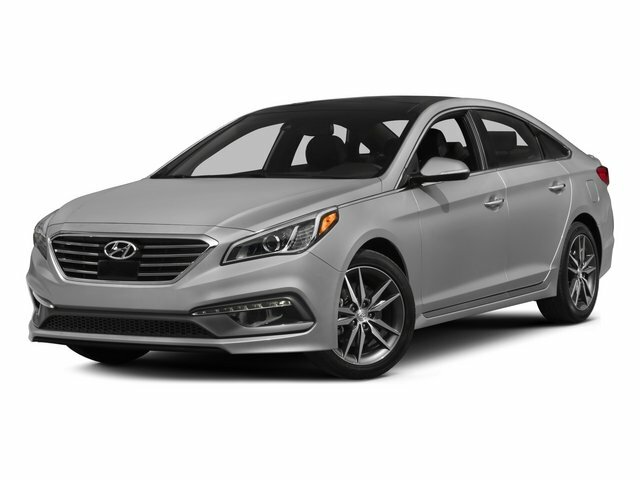 Take the worry out of buying with this reliable 2015 Hyundai Sonata. Tire Specific Low Tire Pressure Warning, Side Impact Beams, Rear Collision Warning, Rear Child Safety Locks, Outboard Front Lap And Shoulder Safety Belts -inc: Rear Center 3 Point, Height Adjusters and Pretensioners. As reported by The Manufacturer Summary: Redesigned for 2015 introducing the all new Hyundai Sonata. Its expressive new exterior is the latest iteration of Hyundai's signature design language, Fluidic Sculpture 2.0. And a new Sport trim includes visual details that give Sonata's sophisticated design an athletic edge. Enjoy the sun, the moon and the stars through Sonata's available, class-exclusive, panoramic sunroof. Sonata's confident new style also redefines the family sedan interior with an ergonomic design and class-leading passenger and total interior space. Inside you will find such features as an available leather-wrapped and heated steering wheel, available heated front and rear seats, and a 5-inch touchscreen color audio system with rearview camera. The available 400-watt Infinity audio system features AM/FM/CD/MP3 and 10 speakers. Sonata's 2.4L GDI engine offers plenty of horsepower, and the new Drive Mode Select is a unique feature in its class that modifies steering inputs and engine mapping for optimal performance. Looking for more power? The 245-hp turbocharged 2.0L GDI engine is equipped on the Sport 2.0T model. The Sonata's available navigation system makes getting to your destination easier. Use voice-recognition or the interactive 8-inch touchscreen for directions without distractions. Use your smartphone connection for Destination Search powered by Google and added functionality including remote start, stop and climate control, plus additional multimedia capabilities including Pandora. Available safety features include Blind Spot Detection with Rear Cross-traffic Alert, Lane Change Assist, Forward Collision Warning, and Lane Departure Warning systems. WINTER PACKAGE -inc: Mud Guards, All Weather Floor Mats, OPTION GROUP 06 -inc: Ultimate Package 06, Rear Parking Assistance System, Lane Departure Warning System (LDWS), Automatic High Beam Assist, Forward Collision Warning (FCW), Electronic Parking Brake, Automatic Vehicle Hold, Smart Cruise Control, full stop/start capability, OPTION GROUP 05 -inc: Tech Package 05, electroluminescent gauges, LED Interior Light Kit, SiriusXM Travel Link (Complimentary Trial), Panoramic Sunroof, High-Gloss Window Surrounds, Integrated Memory System (IMS), driver seat and outside mirrors, Heated Steering Wheel, Heated/Ventilated Front Bucket Seats, multi-adjustable bucket, seatback pockets, 8-way power driver's seat w/2-way power lumbar support and 6-way power passenger seat and impact reducing front seats, HID Xenon Headlights, Radio: AM/FM/SiriusXM/CD/MP3 w/Navigation, iPod/USB and auxiliary inputs, 9 Infinity premium speakers (2 front, 2 tweeters, 4 rear w/coaxial mounted tweeters, subwoofer, and external Infinity amplifier - 400 watts), 8-inch color touchscreen display, and XM NavTraffic, XM NavWeather, XM sports and stock (90-day complimentary subscription) and HD radio technology w/multicasting, 4.2-inch Color LCD Multi-Info Display, OPTION GROUP 05 -inc: Tech Package 05, electroluminescent gauges, LED Interior Light Kit, SiriusXM Travel Link (Complimentary Trial), Panoramic Sunroof, High-Gloss Window Surrounds, Integrated Memory System (IMS), driver seat and outside mirrors, Heated Steering Wheel, Heated/Ventilated Front Bucket Seats, multi-adjustable bucket, seatback pockets, 8-way power driver's seat w/2-way power lumbar support and 6-way power passenger seat and impact reducing front seats, HID Xenon Headlights, Radio: AM/FM/SiriusXM/CD/MP3 w/Navigation, iPod/USB and auxiliary inputs, 9 Infinity premium speakers (2 front, 2 tweeters, 4 rear w/coaxial mounted tweeters, subwoofer, and external Infinity amplifier - 400 watts), 8-inch color touchscreen display, and XM NavTraffic, XM NavWeather, XM sports and stock (90-day complimentary subscription) and HD radio technology w/multicasting, 4.2-inch Color LCD Multi-Info Display, CARGO NET, BEIGE, LEATHER SEATING SURFACES, Window Grid And Roof Mount Antenna, Wheels: 17 x 7.0J Aluminum Alloy, Valet Function, Trunk Rear Cargo Access.